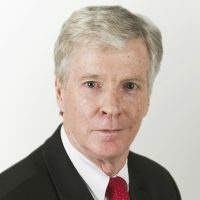 Ambassador Ryan Crocker is currently a Diplomat in Residence at Princeton University. He is on a leave of absence from Texas A&M University as an Executive Professor. From 2010-2011 and 2013-2016, he served as Dean of the George Bush School of Government & Public Service at Texas A&M. He retired from the Foreign Service in April 2009 after a career of over 37 years but was recalled to active duty by President Obama to serve as U.S. Ambassador to Afghanistan in 2011. He has served as U.S. Ambassador six times: Afghanistan (2011-2012), Iraq (2007-2009), Pakistan (2004-2007), Syria (1998-2001), Kuwait (1994-1997), and Lebanon (1990-1993). Born in Spokane, Washington, he grew up in an Air Force family, attending schools in Morocco, Canada, and Turkey, as well as the U.S. He received a B.A. in English in 1971 and an honorary Doctor of Laws degree in 2001 from Whitman College (Washington). He is a member of the Council on Foreign Relations, the American Academy of Diplomacy, and the Association of American Ambassadors. In August 2013, he was confirmed by the United States Senate to serve on the Broadcasting Board of Governors which oversees all U.S. government-supported civilian international media. He is also on the Board of Directors of Mercy Corps International and is a Trustee for the Rockefeller Brothers Fund.